Being a CAN Fund Recipient makes a world of difference for me. CAN Fund’s support makes it easier to attend my training camps in Florida so I can continue to paddle even when the lakes at home are frozen. CAN Fund allows me to focus on what matters most to me as an athlete and takes the pressure off making ends meet. 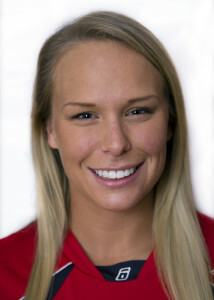 I had an Olympic dream from a very young age and was an intensely competitive child! 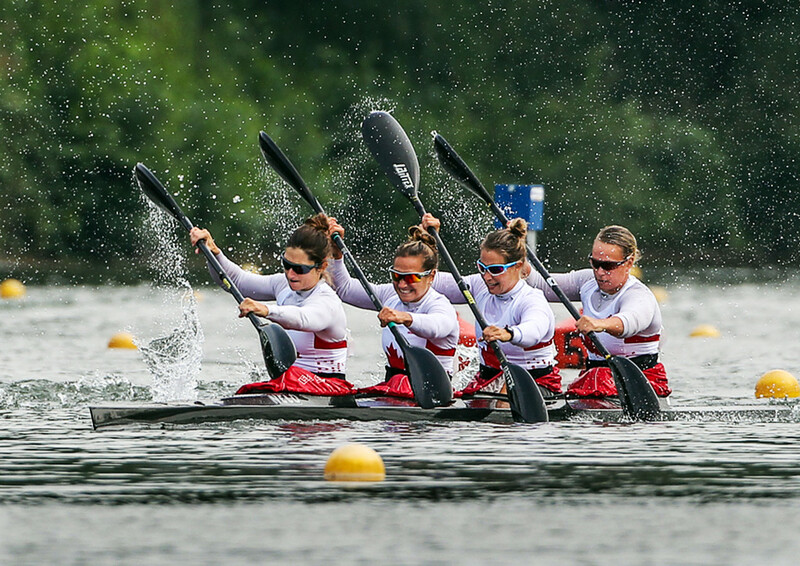 I remember being about 10 years old and meeting the Canadian Women’s K4 team when they were training in Dartmouth. They raced against a master’s men’s K4 and won, which to me was the coolest thing. I thought to myself, I want to be in the Canadian K4 someday. 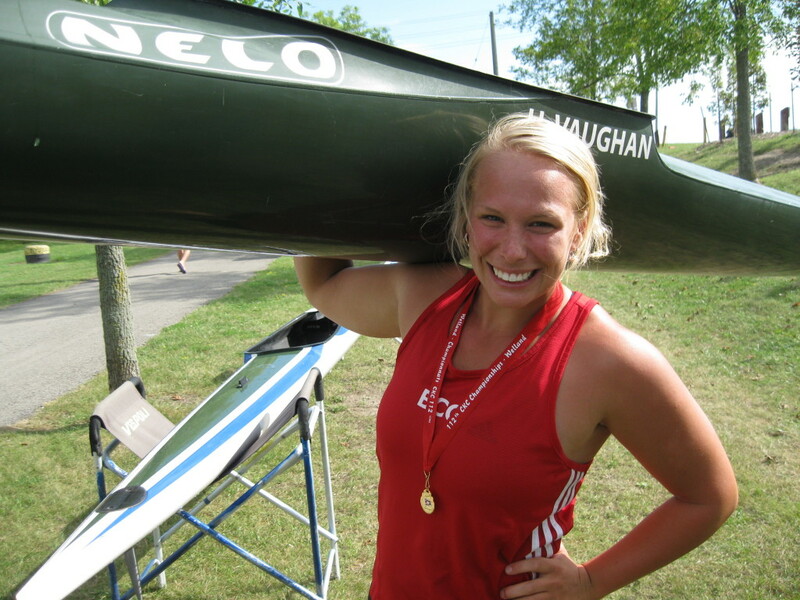 It took 15 years of hard work to earn my seat in the women’s K4, but when I did it, it was the most amazing feeling. Now, as my crew and I train for the Olympics, I can still look to my 10 year old self to remind myself that this is exactly where I want to be. I got involved in canoe/kayak when I was five years old. Paddling is a huge part of the community in Dartmouth, with summers feeling as if they revolve around the lake. 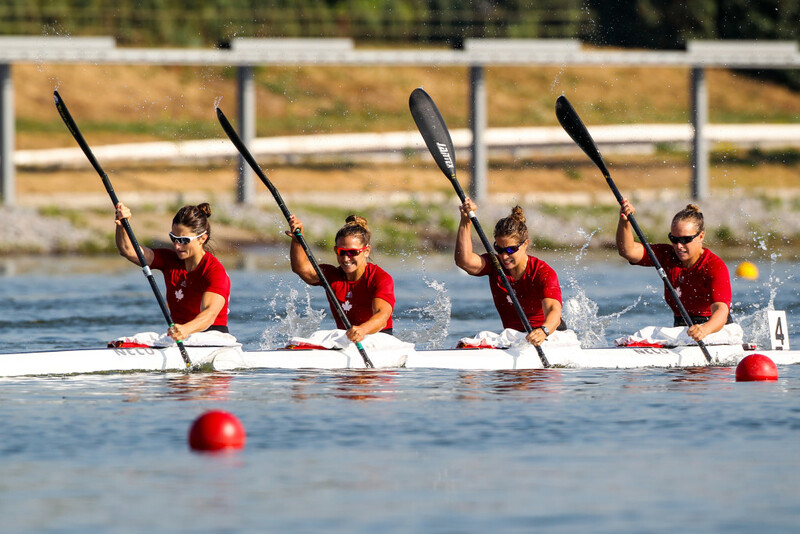 My mother raced for Canada when she was younger, competing in K4 at North Americans, so it was pretty much a given that I would end up paddling! My grandfather, Tom McCluskey, or Poppy to me, is my hero. He was always in my corner. As a former boxing trainer and member of the PEI Sports Hall of Fame, he understood an athlete’s perspective and always encouraged my dreams. He was my first coach, my biggest inspiration and my number one fan. He was tough as can be. He went to war when he was 16, he fought as a boxer himself, and went on to train many successful fighters (Trevor Berbick, who went on to be World Heavyweight Champion, and Ralph Hollett). But beyond that, he had the gentlest heart and the greatest sense of humour. He was a talented folk artist and a masterful storyteller, and made friends wherever he went. He passed away in February 2012, leaving a huge impact and many full but heavy hearts. I am inspired by him every single day, in training and in all aspects of my life. In his memory, I have a poppy sticker on the nose of my K1 boat and race with a poppy pin over my heart. I can’t get enough of toasted ezekiel sprouted grain bread topped with avocado, lemon, and a pinch of sea salt. I love to cook, so it’s hard for me to pick a favourite recipe! I love to experiment in the kitchen, and find it therapeutic to create new dishes (just don’t get in my way as I’ve been known to show shades of Gordon Ramsay!) If I had to pick one dish, I’d say that I do make some pretty fantastic seared scallops. My fridge is stocked with the necessities for the upcoming week of hard training. At a glance, I have berries, milk, almond milk, eggs, sugar free bacon, spinach, asparagus, brussel sprouts, cheese, orange juice, avocado, peppers, sprouted grain wraps, bread, hummus and almond butter. Plus some shredded chicken and pulled pork from a weekend of slow cooker prep! Jan has the ability to look at me and know right away when I’m overthinking. To be fair, I’m often thinking too much, so the odds really are in his favour. Jan is great at reminding me to just chill out and roll with things. I love being on the road with my teammates. We share a common dream and it’s inspiring to spend time with those who have the same goals. As paddlers, we spend at least half of the year together at training camps and regattas, so we know each other very well. My favorite places I have visited are quite different: Iceland and Trakai, Lithuania. After a long season of intense racing and training for both of us, my boyfriend and I took off on an otherworldly Icelandic adventure. The scenery and magic of the island provided the restart button we needed to prepare us for the next year. Trakai, on the other hand, was where much of Canoe/Kayak Canada had our pre-Worlds training camp. We trained on a stunningly beautiful lake with a castle in the middle. It was the most perfect place to train as we had no distractions and were able to put our entire focus on being the best we could be at the World Championships. On every road trip, I take my iPad so I can stay in touch with family, compression gear for flights and recovery, and a good book to stay entertained. I recently started painting canoe paddles as a hobby. 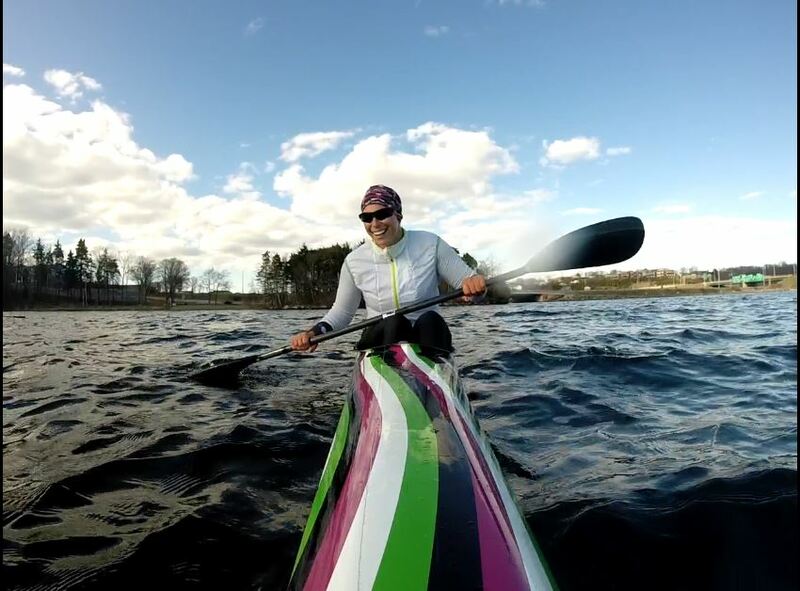 I’m inspired by so many aspects of my sport, the beautiful colours I see in nature when training, vibrant uniforms and even boat designs! Luther. My boyfriend and I had a marathon through the entire series over a few days at a training camp!